All is Fair in Love and Art? An odd love triangle among three glamours legends: Ryan O’Neal, Farrah Fawcett, and Andy Warhol. The issue: who owns a $12 million pop art portrait when the relationship is on-and-off, and the University of Texas claims it was gifted to them in a trust? O’Neal and the school are duking it out in a jury trial where a rotating cast of appraisers, nurses, ex-lovers and academicians are testifying. Who needs Hollywood when we’ve got drama like this in the court?! Get your art law gossip fix here. This entry was posted in 2013, Fall and tagged Andy Warhol. The trove of Nazi-era art of previously unregistered works by Marc Chagall, Otto Dix, Max Liberman and Henri Matisse found in an apartment last March has presented some interesting legal questions. There are a few layers of shady, potentially criminal, activity at work here, the initial Nazi-looting and then the dealings of the art dealer whose son’s apartment held the work. 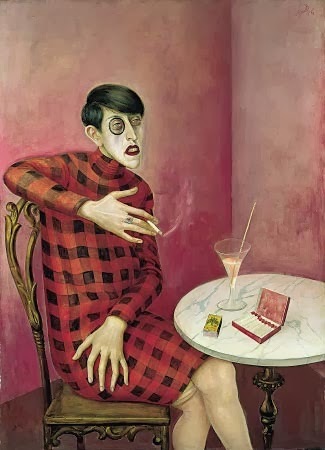 Authorities and journalists have questioned the methods by which Hildebrand Gurlitt, a German art dealer, acquired the paintings throughout the 1930-40s. Interesting twists are ahead as authorities attempt to determine who are the rightful owners of the works. Banksy’s month long residency is over but the shenanigans and ensuing media coverage continues. This time, three men were arrested after removing the “Banksy!” balloons from a building in LIC. The piece was impounded and will stay in police custody until someone claims the balloon, legally. Check out this article in which a bunch of art dealers and “Banksy specialists” try to convince the building owner to give it to them to sell. The quotes from a deputy officer are particularly entertaining, at one point saying, “[w]e don’t have it as art…[w]e have it as balloons.” I guess that puts an end to the ongoing dispute over whether Banksy has any artistic merit. Not. In 2010, Key West City Commission passed an ordinance requiring 1% of new and re-developments over $500,000 and $100,000, respectively, be put towards a fund for public art projects. Passage of the ordinance coincided with the stagnation of the building market so very few funds were raised but things are looking up as there are a few substantial projects in the city’s pipeline. The Commission has tweaked the ordinance so that developers are now able to choose the artist their contributions will fun. While part of me thinks this change defeats the purpose of the ordinance, my better half believes its a positive step in the right direction. A Qatari poet was jailed for two years in solitary confinement for reciting a poem in support of the Arab uprisings on YouTube. The poet was found guilty of “incitement to overthrow the Emir” last month and sentenced to life in prison. Due to “irregularities” in the trail, the Criminal Court in Doha reduced his sentence to 15 years. Upon the government’s attempt to reinstate the life sentence, the Court upheld the 15 year sentence. For shame. This entry was posted in 2013, Fall and tagged Banksy, Gurlitt, Henri Matisse, Marc Chagall, Max Liberman, Otto Dix, Youtube. The street art collective 5Pointz won a stay of execution (restraining order) freezing the building owner’s demolition preparations. It’s all over the news: here, here, here, etc. Lawyers for the collective centered their arguments on a clause from the Visual Artists Rights Act of 1990 (VARA), which allows certain visual artists to prevent the unauthorized destruction or alteration of works installed in buildings. I’m not a proponent of high-rise, luxury apartment buildings. The proposed building is one of the last things LIC needs, other than more hipsters. However, I am not entirely sure what the collective hopes to achieve through this suit. In this article, Ms. Chanes, one of the attorneys for the collective, called Judge Block “a judge for the 99 percent.” Last I checked, OWS is on an indefinite hiatus. The victory is a far cry from the injunction that the collective hoped for and likely to be short lived. Furthermore, the whole endeavor seems like a futile battle against the implicitly ephemeral nature of street art. 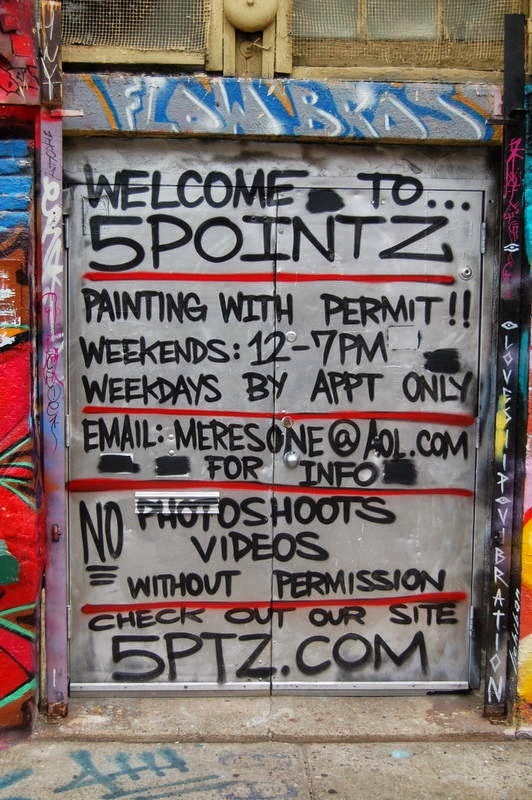 Last time I visited 5Pointz, I watched the building serve as a backdrop for a music video, variety of fashion-centric photo shoots and quasi-gallery opening. We get it, the place is cool but the hype is entirely counter to the ethos that spurred the street art movement. Shouldn’t these artists, who pride themselves on their ability to make art in unlikely places, while flouting institutionalized notions of “art,” move on? That the building is called a “mecca” is unsettling to me and fundamentally inconsistent with the movement it represents. This entry was posted in 2013, Fall and tagged Street Art, VARA. No one gets between me and my…tattoo artist. The Washington D.C. Department of Health proposed a 24-hour waiting period for people seeking a tattoo or body piercing. Check out the Notice of Proposed Rulemaking here. In line with agency notice and comment requirements, the public has 30 days to comment on the proposal before it could become a final regulation. My gut reaction is that it’s an overreach with a whiff of nanny state mentality. Doesn’t D.C. have more important things to worry about than my improperly translated tramp stamp (sorry, lower back tattoo)? Check out the contract that convinced Antonin Dvorak to relocate to New York from Prague. Despite the substantial challenges posed to artists and journalists who travel to Guantanamo Bay, a few have been granted access over the years. The works of some artists will available to the public this fall. With turmoil and subsequent looting increasing, Egyptians are banding together via social media in an effort to protect their archeological sites, monuments and museums. Exorbitant executive pay extends to private foundations. Not exactly a surprise. However, accusations of mismanagement by foundations tied to artists’ estates are increasing and pretty shocking. This entry was posted in 2013, Fall and tagged artists' estates, body art, Egypt, Estate Planning, social media. Robin Thicke and Co. are seeking a declaratory judgment that the summer hit “Blurred Lines” (or is it #blurredlines?) does not infringe upon the Marvin Gaye song, “Gotta Give it Up.” Decide for yourself here and here. Talk about “blurred lines”…. GET IT? The Attorney General of the SDNY and New York office of the FBI charged James Meyer, Jasper Johns’ studio assistant, with the theft of 22 “unauthorized” Johns works. Meyer was charged with one count of interstate transportation of stolen property and one count wire fraud. Another forgery scheme involving Knoedler & Company has been uncovered. This time, a dealer sold the gallery paintings mimicking those of American masters. Pei-Shen Qian, a 73-year old Chinese immigrant, is suspected of forging the paintings in his Woodhaven, Queens apartment. Glafira Rosales, a dealer accused of hawking the forgeries in Manhattan, has been charged with money laundering and tax evasion in connection with the sales. The FBI became involved when suspicions were raised about the authenticity of some Robert Motherwell paintings. The Oakland County Art Institute Authority, one of of the three counties that sends DIA $9.8 million a year as part of a three-county tax, unanimously passed a resolution that would dissolve its financial obligations if the city sells any of its collection. This entry was posted in 2013, Fall and tagged Artemisia Gentileschi, copyright, DIA, Eva Hesse, Knoedler & Co., Robert Motherwell. "Museums are for the Dead, I Want Life"
Image courtesy of The Superslice. 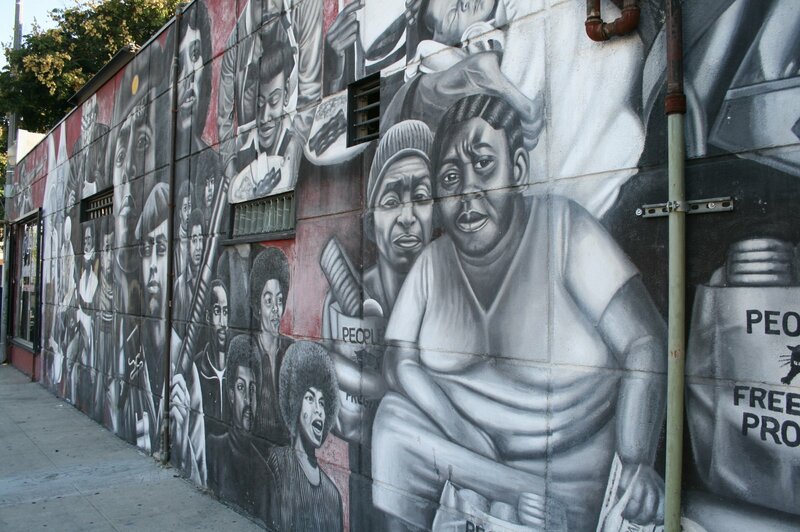 According to a source “close to the decision-making process,” there is a good chance that the Los Angeles Planning and Land Use Management Committee will reverse the ban on the creation of murals on private property when they vote next week. Check out a great video short on The Superslice about efforts to save public art in the city. Follow the non-profit, Save LA Murals, on Facebook . A New York Supreme Court justice dismissed a suit against photographer, Arne Svenson, for pictures he took of his neighbors without their permission. The couple bringing the suit sued Svenson for violating their privacy when pictures of their children appeared in his images. The presiding justice concluded that, while it was cringe worthy to think a persons private life and images of their children could end up in the public forum without their permission, there is no redress under New York law since art is protected under the First Amendment. A biography written two years ago has reopened the presumed suicide by Van Gogh for examination. The writers propose the theory that a 16 year old school boy, with whom Van Gogh was acquainted, shot the artists. The Van Gogh Museum in Amsterdam has weighed in, remaining unconvinced that his death was anything other than a suicide. The forensic evidence seems to support the belief that Van Gogh did in fact commit suicide but who doesn’t love a good conspiracy theory? The idea of buying art on Amazon appeals to me on a democratic level. However, it appears the site experiences some of the same transparency issues galleries are confronted, with as well as problems unique to internet shopping. This entry was posted in 2013, Fall and tagged Arne Svenson, art investment funds, Fakes & Forgeries, freedom of expression, photograpyhy, publc art, Street Art, Van Gogh, Van Gogh Museum. Judge Oetken of the S.D.N.Y. issued his Biro v. Condé Nast opinion. J. Oetken granted The New Yorker and Grann’s motion to for an order finding Biro to be a public figure, as well as their motion for judgment on the pleadings, and granted the remaining defendants’ motions for dismissal for failure to state a claim. Notably, the claim against Gawker Media was dismissed as time barred, the statute of limitations is one-year in New York. J. Oetken reiterated that, under the single publication rule, a story’s continued presence online does not affect how time accrues. Additionally, J. Oetken determined Biro met all four prongs of the Lerman test, constituting as a limited purpose public figure. Thus, in order to survive dismissal, Biro’s complaint had to sufficiently plead actual malice (“a term of art denoting deliberate or reckless falsification [J. Oetken, 30]). The opinion heavily referenced the affects of the “Twiqbal” standard on defamation actions, as well policy concerns for First Amendment rights. In the end, Biro could not surmount the heavy “actual malice” standard. Check out additional coverage here and here. Christie’s has confirmed they will assist in appraising the Detroit Institute of Art’s collection. Although the museum will cooperate, they have reiterated their belief in the Attorney General’s statement that the collection is a charitable trust which cannot be sold as part of a bankruptcy proceeding. So, then why is Christie’s being paid $200,000 for their appraisal services? In any case, even though the city is an economic sinkhole, its art scene is flourishing according to the New York Times. Music publishers sued Fullscreen, one of the largest suppliers of videos to YouTube, after a breakdown in licensing negotiations. A federal judge in Manhattan refused a motion by Arrow Productions to block the release of the movie “Lovelace,” alleging that the movie contains unlicensed footage. Lastly, a Court of Appeals judge for the 9th Circuit ruled that Green Day did not infringe on the rights of a street artist when they incorporated his art work into their video backdrop. A Manhattan doctor bought a deserted island off the Keweenaw Peninsula, MI then put a conservation easement onto the property and started an artist’s colony. Also, BUY LOCAL. Local art that is, apparently community supported art organizations are springing up everywheeeeeeere. This entry was posted in 2013, Fall and tagged Christie's, DIA, freedom of expression, N.Y. Times, Street Art.